By individually rotating the shades, the Multi-Lite Pendant Lamp can be transformed into multiple combinations where the light can be directed upwards, downwards or exude an asymmetrical art light. The Multi-Lite was first drawn in 1972 when Louis Weisdorf did an exception to his own design custom of using multiple repeating elements. Instead it reflects his passion for diversity. 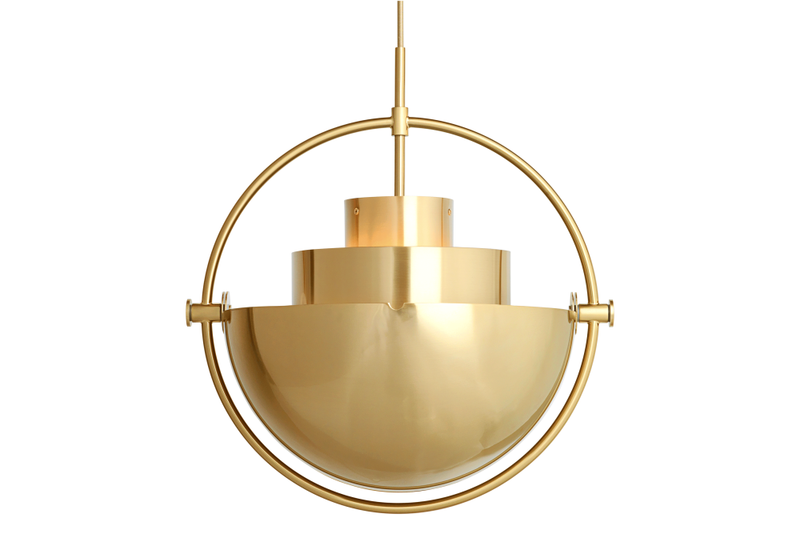 Two cylindrical shapes lay the foundation of the lamp and a metal ring encompasses it and anchors the two quarter-spherical shades, which ultimately completes a picture of an iconic design with multiple purposes. The Multi-Lite Pendant Lamp has a timeless expression that fits into any domestic setting. In his own words, the studio of Architect Louis Weisdorf (born 1939) "specializes in versatility". This, quite perfectly, sums up the long and notable career of this multi-designer. Since graduating from the Royal Danish Academy of Fine Arts' School of Architecture in 1954, Weisdorf has worked with everything from graphic-, interior- and industrial design, to the planning of parks and recreational areas as well as most fields within the building trade. This adds to an impressive résumé of notable projects, which includes working with icons such as Verner Panton, Poul Henningsen and Le Klint. At Gubi, we're on a continual quest. A journey. Fuelled by our passion to discover overlooked icons from the past and future icons in the making, we've made a distinctive name for ourselves in the international design arena as a dynamic design force to be reckoned with.